Galaxian for the Atari 2600 is a technical marvel (let’s just say there’s a reason why it took so long to appear on the system) and is overall a fine port of the arcade original. There are things that bug me, like the size of the cannon (too large) and the fact that the programmers decided to put an orange wall around the playfield. Minor quibbles, though, for a game that is just as much Galaxian as any other version of Galaxian (in the case of the Atari 5200 version, perhaps moreso considering that port feels like an entirely different game even without taking into account the awful controls). Fear not - this is one of the more exciting and frenetic shooters for the Atari 2600. Your shots travel rapidly and holding down the fire button initiates continuous fire. In later stages multiple aliens glide across the screen at a time, so you'll need to avoid collisions as well as falling bombs. Pay special attention to those dangerous purple ships that make extra-wide sweeps. You can usually "thread the needle" between the falling bombs, but take care not to get trapped in the corners. Galaxian has a nice flow to it, and once you get in a zone you can pick off as many as dozen aliens in a row. As with the original arcade game, it's possible to blast two with a single shot, and dude - that is awesome. The audio effects perfectly recreate the same pulsating electronic sounds you'd associate with a typical alien invasion (we've all been there). With solid gameplay and nine skill levels, Galaxian delivers pure shooting satisfaction. Still, this is a solid title that's easy to find and is a welcome addition to any Atari 2600 collection. Sure, it plays like an updated Space Invaders, but that's perfectly fine -- a game that offers a novel twist on an established formula is typically enjoyable. Galaxian is a game so underrated that it's almost impossible for me to walk past a Space Invaders machine without throwing it a dirty look and shake of the finger. Galaxian is a masterpiece adrift in a sea of mediocrity, and far too much of its hard earned historical thunder has been stolen by Taito's original coin guzzler. You can put up with the graphics though, it's sound that suffers here most. It really is awful with obnoxious effects, half-assed attempts at music and even sounds that play at the wrong time! It controls much better than its 5200 cousin, thanks to a digital joystick, but that is scant consolation really. Sure it is still Galaxian and it is a fun game when you get past the flaws but you just cannot help but think Atari should have done so much better here! Galaxian macht Spass! Punkt! Ich schiebe dieses Modul regelmäßig in den Schacht meines Juniors und auch während des auführlichen Tests habe ich eine lange Zeit gezockt. Das Gameplay ist schnell und für ein Atari 2600 Spiel ist eine Unmenge auf dem Bildschirm los. Hier kann man auch einige Runden Spielen, ohne wie bei Space Invaders mit seinem Leben dafür zahlen zu müssen, weil man zu langsam war, den letzten Alien rechtzeitig zu erwischen. Dennoch fällt bei einem solchen Vergleich schmerzhaft auf, dass die schon angesprochenen Spielvariationen fehlen. Einen Fan des Genres darf dies aber nicht abhalten. Eine solche Perle sollte man nicht verpassen! Fans of the arcade game will not be disappointed. The aliens are multicolored and they're pretty well detailed. The sound effects are similar to those in Space Invaders, and make you feel as if these creatures are really marching. Some people may be tired of this type of game, since it lacks the surprise of newer contests for the VCS. Galaxian pales in comparison to Galaga - a personal fave - but one needs to remember the timeline of when these games were originally available. Galaxian is a great game and still cool to play for fun and nostalgia. Pop it up to one of the higher skill levels to see what a frantically wonderful game this can be. Galaxian é mais um jogo de batalha espacial. Sua nave deve derrotar os inimigos que atacam em bloco. Mas cuidado, pois eles se transformam em pássaros que lançam bombas na sua nave. Another very good Atarisoft offering that seems to have all the features of the original. The sound is good, the action fast and it plays superbly. Well worth collecting, if only for the nostalgic value. Galaxians is a classy reproduction of the arcade game and one that deserves to be in all shoot-em-up fans games collection. In terms of replay value, you're looking at a game where the only real replay value comes from trying to beat your high score. But this game is entertaining enough that you just may want to do that a bit. The gameplay doesn't seem overly dated today (other than the lack of rapid fire), and this game is easily as fun now as it would have been then. If you are a fan of the Atari 2600, this is a game to look for. Le plus célèbre des envahisseurs de l'espace. 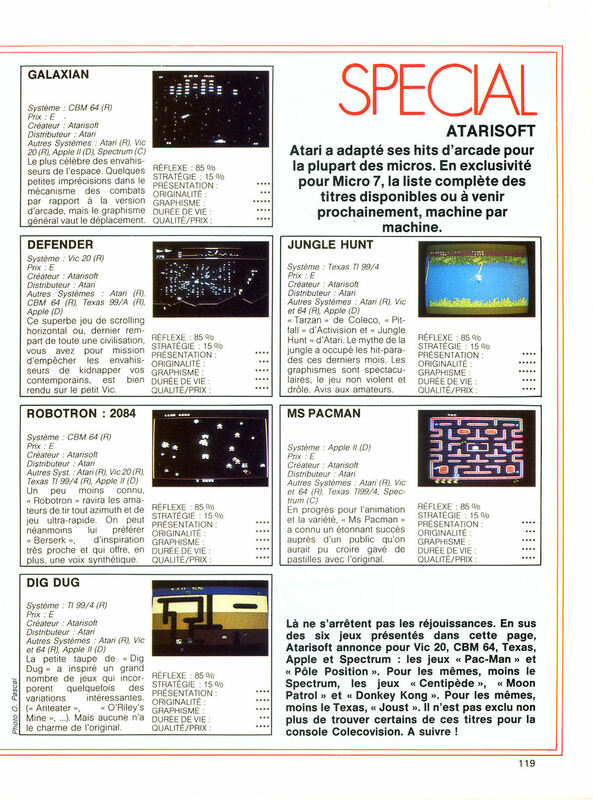 Quelques petites imprécisions dans le mécanisme des combats par rapport à la version d'arcade, mais le graphisme général vaut le déplacement. Galaxian suffers from poor control on the 5200. It's a great game robbed of greatness by lack of control. Had a Galaxian cartridge come out two years ago, this would be a four-joystick review. And if you haven't seen some of the incredible new games the arcade and home manufacturers are making, Galaxian may still thrill you. But if you played Galaxian a while back and now you've moved on to Zaxxon and Subroc, you should search for other playfields to conquer. Ce jeu, au principe bien connu, a toutes les chances de « marcher » auprès des amateurs de combats spatiaux. L'idée de base est celle de Space Invaders : plusieurs rangées d'attaquants se déplacent en haut de votre écran en mitraillant le sol. Vous, aux commandes de votre canon laser, vous tentez de les abattre, sans, bien entendu, vous faire toucher. Dans ce jeu, une amélioration très sensible intervient : certains membres de l'escadron volant se détachent et foncent vers vous en vous arrosant de missiles. The crude audio effects are another black eye. The rhythmic "cadence" sounds like a constipated robot, and the explosions sound like rubber bands and trashcan lids. Once you get on a roll, it sounds like you're beating up the black guy from the Police Academy movies! After my original disparaging review of this game, a thoughtful reader informed me that I should play this using the track-ball controller. I'm glad I did, because the track-ball provides a fine degree of precision that even surpasses the arcade game! In fact, if you own one of these massive controllers, you can safely bump up the grade by not one but two whole letter grades! On a side note, my friend Mike taught me an alternate way of playing Galaxian - by not shooting at all! That's right, this "boogie style" of play is done by touching the missile on the tip of your cannon to oncoming aliens. Now there's a challenge! 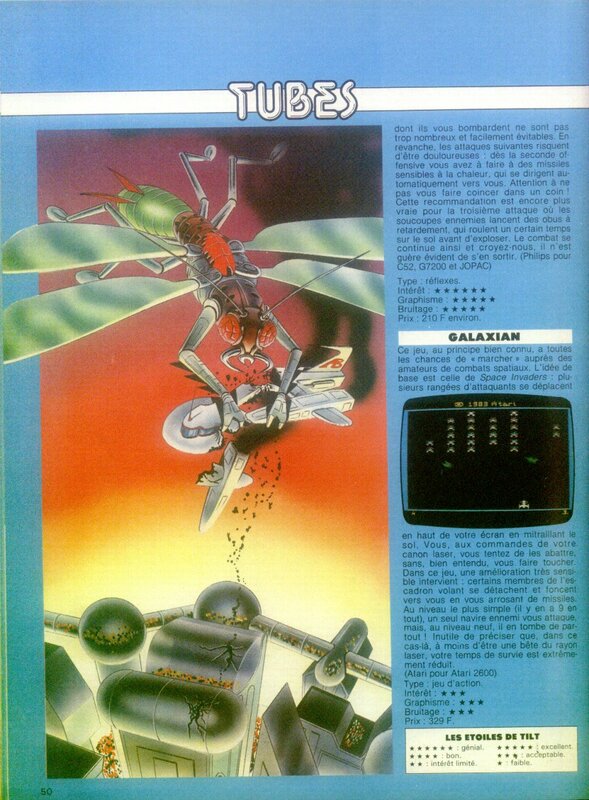 Galaxian should have been one of those games that should have helped sell the 5200 system. Sadly, the terrible sound effects, poor controls, and repetitive game play ruin this classic shoot em up so the whole title acted as video game repellent. This game was never one of favourites to begin with but this version made it even worse because of the extremely sloppy translation here. Avoid Galaxian for the 5200 unless you need another hockey puck.